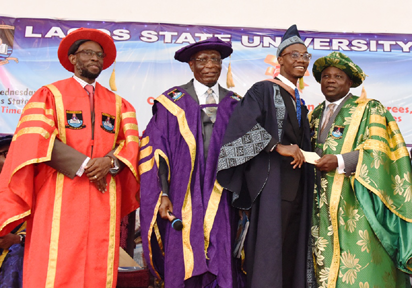 It was an emotional laden moment filled with joy, excitement and sense of fulfillment when Lagos State Governor, Mr Akinwunmi on Wednesday granted scholarship and N5million cash reward to the overall best graduating student of Lagos State University (LASU), Ogunsanya Fuhad Adetoro. Ogunsanya, who bagged 4.78 Cummulative Gross Point (CGPA) in Business Administration, had earlier in the valedictory speech narrated his rag-to-fame story. He also shared with the gathering his battle with cataract that affected his two eyes and how he underwent two surgeries at the University of Ibadan Teaching Hospital (UCH) to have the eye defects corrected. Apparently moved by Ogunsanya narration, Ambode said he would adopt him as a son. He also said he would be giving the best graduating student a scholarship to study at any choice school of his/her preference, anywhere in the world. “Yours was a moving story and I’m assuring you that you can chose and study at anywhere in the world. And because you are also the best graduating student, I will be giving you, N5 million,” the Governor said.